A possible vaccination schedule for the ‘average’ indoor house cat is shown below. Chlamydophila (Pneumonitis): include in combination vaccine where it is a concern. Feline Leukemia (FeLV): for kittens at risk of exposure to feline leukemia virus. FeLV: for kittens at risk of exposure to feline leukemia virus. FeLV: for cats at risk of exposure to feline leukemia virus. Rabies: Given by your local veterinarian (time interval between vaccinations may vary according to law). 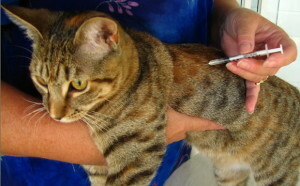 *A combination vaccine includes feline distemper, rhinotracheitis, and calicivirus. Some may also include Chlamydophila. **According to the American Veterinary Medical Association and the American Association of Feline Practitioners, cats at low risk of disease exposure may not need to be boostered yearly for most diseases. Consult with your local veterinarian to determine the appropriate vaccination schedule for your cat. Remember, recommendations vary depending on the age, breed, and health status of the cat, the potential of the cat to be exposed to the disease, the type of vaccine, whether the cat is used for breeding, and the geographical area where the cat lives or may visit. Ford, R.B. Feline Vaccination Guidelines. In Bonagura, JD; Twedt, JD (eds.) Current Veterinary Therapy XIV. W.B. Saunders Co. Philadelphia, PA; 2008; 1275-1278.Greene, CE; Schultz, RD. Immunoprophylaxis. In Greene, CE (eds.) Infectious Diseases of the Dog and Cat, ed 3. W.B. Saunders Co. St. Louis, 2006; 1069.Klingborg, DJ; Hustead, DR; Curry-Galvin, EA; Gumley, NR; Henry, SC; Bain, FT; et al. AVMA Council on Biologic and Therapeutic Agents’ report on cat and dog vaccines. Journal of the American Veterinary Medical Association. November 15, 2002 (Volume 221, No. 10); 1401-1407.Levy, J; Crawford, C; Hartmann, K; Hofman-Lehmann, R; Little, S; Sundahl, E; Thayer, V. 2008 American Association of Feline Practitioners’ feline retrovirus management guidelines. Journal of Feline Medicine and Surgery. 2008; 10:300-316.Richards, JR et al. The 2006 American Association of Feline Practitioners Feline Advisory Panel Report, Journal of the American Veterinary Associaiton, 2006; 229(9):1405.